Is your business using Reserve with Google (RwG) to double your appointment bookings yet? 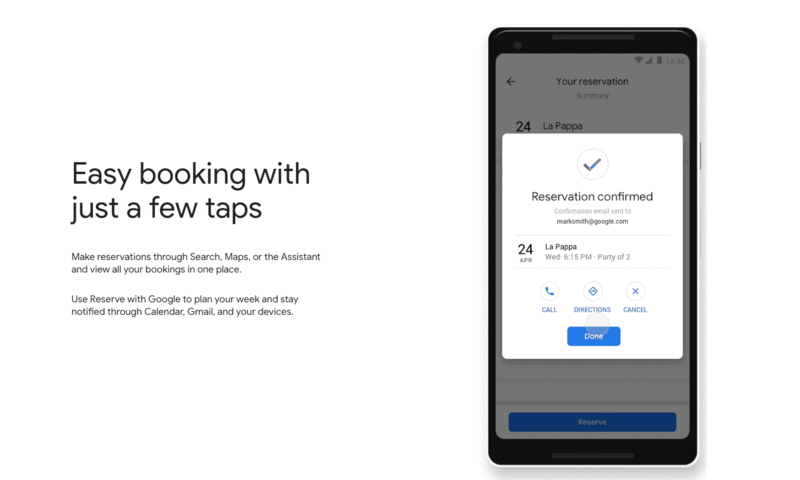 Reserve with Google is the newest way to completely revolutionize your bookings this year – for free. Simply put, RwG allows Google searchers to discover and book your services straight from your Google My Business listing (yes, you heard us right). There are a lot of compelling reasons why your business should be taking advantage of this new booking system as soon as you can. But, that’s not the only thing we want to share with you today: This blog post is also about the fact that RwG will be launching in 5 additional countries, bringing the grand total to 36! Read on to find out more on the powerful benefits of RwG for your business (and how to sign-up) plus the full list of new countries RwG will be launching in. Double Your Appointment Bookings This Year (Without Any Extra Effort) The reason why RwG is so powerful is because it makes it easy for clients to book services straight from Google. Remember: millennials don’t want to ever have to pick up a phone to book an appointment. Google acts in much the same way that Expedia does for the hotel industry. This means your business is working for you 24/7. RwG gives your business a boost so you don’t have to worry about driving enough traffic to your website. Here’s one important thing to understand: a hyperlocal marketing strategy is becoming increasingly critical for brick-and-mortar success. And here’s why: 76% of people who make local-based searches on their phone end up visiting the store the same day. This comes straight from Google. And this is exactly why having your business listed on Google My Business in the first place is so critical. Give Your Business a Competitive Edge. Not every business has access to RwG. They have to be using scheduling software that has partnered with Google in order to do so. By making it easy to for clients to book your services straight from Google, you give yourself a competitive edge. Who Is Eligible and How Do I Sign Up? The good news is that just about every business (with the exception of medical providers) are eligible for RwG. Whether you are in the beauty industry, the wellness industry, the fitness industry or even the dog grooming industry, you are eligible to use RwG. So, how do you sign up? If you use Yocale, the RwG button has already been added to your Google My Business listing. You don’t need to do anything. Not a Yocale user? Not a problem. You can sign-up for free here. What Countries Are RwG Launching In? What Countries Are Rwg Already Supported In? A hyperlocal marketing strategy (i.e. listing your business on Google My Business) is critical for brick-and-mortar success. We know this because the majority of people who make local-based searches are likely to visit your business that same day. Reserve with Google, then, makes your Google My Business listing even more powerful by adding a ‘book now’ button to it, therein making it possible for searchers to book your services right then and there. Do you want more appointment bookings this year? Yocale is home to the leading scheduling software on the market. Our easy-to-use calendar gives you the extra hand to both run and grow your business at once. Click here to sign up for FREE or learn more. You can also book a personalized demo here.